I recently attended the wedding of a British couple at this little chapel. There are several chapels on Las Vegas Boulevard (otherwise known as the Strip) but this is the only on at this South end. It is a little way down and the other side of the road from the Mandalay Bay, and a little way up from the famous “Welcome to Fabulous Las Vegas Sign”. They offer several different packages, from a $260 basic ceremony plus a few photos to a $3100 package where they provide flowers, a limo, lots of photos and online webcast of the ceremony. We had their $2100 package and everything was lovely. A limo collected the bride, her mother, and myself from the Cosmopolitan, and we had bottles of water in the back, their more expensive package comes with champagne. We didn’t need it, I had picked us up a couple of bottles on the way that morning, so we had a glass or two in the room. 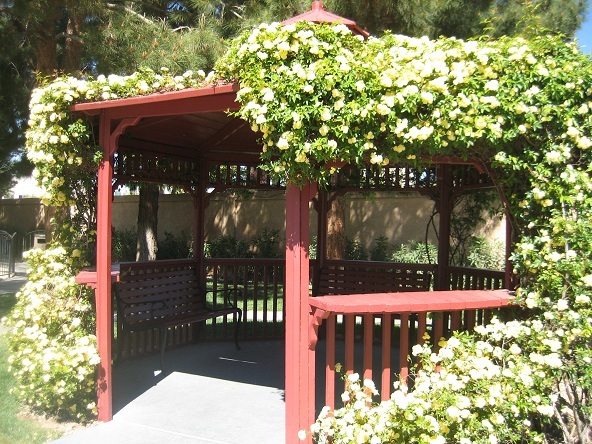 We arrived at the Chapel, and the groom and guests were waiting for us under their pretty garden pagoda, providing some much-needed shade. Their office staff were as pleasant in person as they had been by email and come out to greet us and give us our flowers. The officiant arrived and was careful to usher the groom and guests into the Chapel without seeing the bride. We had photos of the bride and her party before going in, then photos all the way through the ceremony. The officiant performed a lovely ceremony, all by heart, so he has obviously performed quite a few of these. The couple were able to tell their friends and family back how to watch the ceremony online, so they could feel like they were involved too. More group photos in the chapel and then off to the famous sign for our photos there. Then we went back to the Cosmopolitan, where they were staying. The offices and bathrooms are not too photogenic, but the couple don’t really see them, and they are far from your wedding photos. The staff are all pleasant and efficient, and everything ran quickly and smoothly. The couple received their marriage certificate within a week or so of return from their honeymoon. The garden and lawn are pretty and provide a nice backdrop. 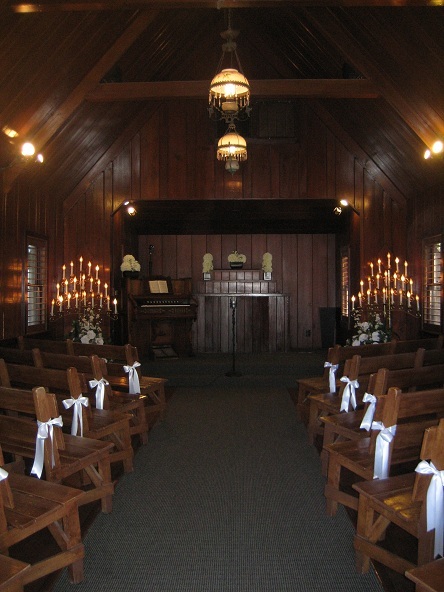 The chapel is wooden, inside and out, and tastefully decorated. 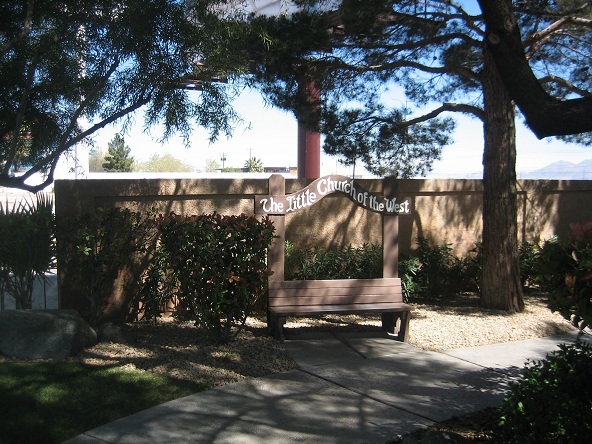 There is enough seating inside the chapel for a very large party by Vegas standards, and there is a good-sized parking lots outside. This is one of my favorite non-casino chapels. I like the location and I like the chapel itself. 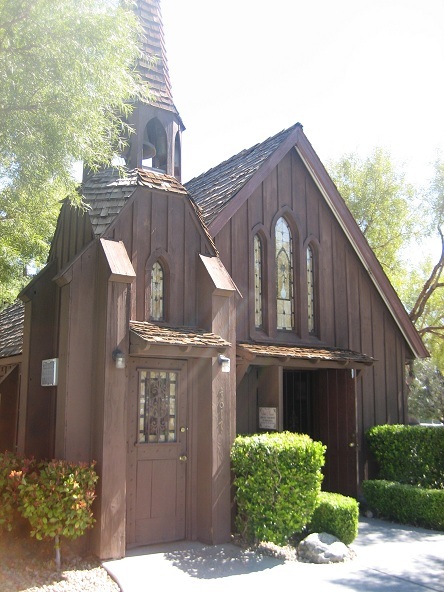 This entry was posted in Las Vegas, weddings and tagged chapel, Las Vegas, Las Vegas chapel, Little Chapel of the West, wedding chapel, weddings. Bookmark the permalink.